Graveyards are the place of hauntings and folklore: shadowy figures surfacing in photographs, unexplained voices crying out in the night, and mystical swirling forms that materialize in the foggy distance. But a different type of legend also lurks. Museums of memories flow through graveyard’s invisible portals, bringing together the living and the dead. Tombstone etchings can only scratch vague surfaces of the real history that has been left behind. In Loving Memory. Devoted Wife. Loving Husband. Cherished Daughter. Precious Son. Faithful Friend. It isn’t until visitors—living visitors—wander through the cemetery gates that a connection between past and present is firmly established and the memories and history begin to offer up their richest rewards. I lived across from Graceland Cemetery at Clark & Irving for many years. Resting here among the famous Chicago deceased is the great Jack Johnson, the world’s first African American heavyweight champion of the world (a title he held for 7 years from 1908-1915 despite numerous attempts to find a Great White Hope to dethrone him and return a prejudicial world back to a “rightful” order). For those looking to pay homage and stand toe-to-toe with heavyweight history, make a pilgrimage to Chicago’s Graceland Cemetery and look for a large stone that simply reads, Johnson. The otherwise unmarked grave provides a stark contrast to the champion who lived loud and proud during a volatile time of extreme prejudice and racial divide. 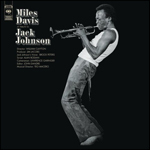 Someone once gave me the album, A Tribute to Jack Johnson, and prefaced it with, “Great guitar.” So began an unlikely introduction to another ghost departed, Miles Davis, through an album ironically selected for me because of its awe-inspiring offering of electric guitar (John McLaughlin). As it turned out, shining the spotlight on the album’s guitar was a wonderful way to dip my feet into the cool refreshing unpredictability that surrounds any jazz trip. Certainly, if any genre demonstrates a golden rule of music that seems perfectly suited as a template for life as well, it is jazz music with its understanding that a whole is only really ever achieved through a seamless blend of all parts. Segregation has no place here. It isn’t a rock anthem arena where a lead singer can stand front and center, simultaneously draping and overpowering the instruments. It is a brew, a harmonious fusion. It is a celebration of thoughtful construction that would do Frank Lloyd Wright proud. And while on the subject of construction, what also stood out for me during those first few listens was the structure of the album: consisting of just two (albeit lengthy) songs. The joy ride that ensued from this fresh take on format was akin (although opposite in terms of duration) to the jolt of song length deconstruction offered up by the punk gods, Minutemen. New ideas and destinations have a way of triggering blissful, altered states. Stripped of expectations and unfiltered by the boundaries of routine, you feel the rush, like the epiphany you get looking out over unimaginable vistas of natural wonder—thoughts of Bryce Canyon, a Delicate Arch, and Rocky Mountain highs come racing into focus—and you realize yet again that you are a mere atom, lost in space and time. Coming full circle, the jazz soundtrack that accompanies the scene reminds you that every last speck—you included—is nothing less than essential to the breathtaking whole.